Eagle-eyed (and long suffering) Theater Hopper fans will notice a couple of callbacks in today’s strip. Believe it or not, but the giant soda cup made it’s first appearance over TEN YEARS AGO in this comic. Yes, comically oversized concession stand soft drinks were hilarious even back then! 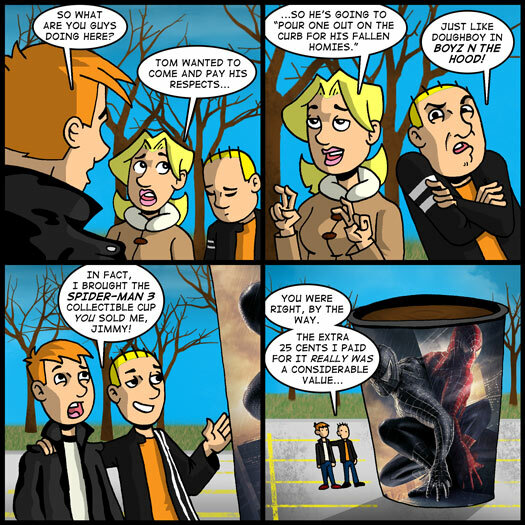 The Spider-Man 3 collector’s cup was featured prominently in the blog post of this comic from 2007. This was after I eviscerated the movie in my review that was posted here. I remember people being really, REALLY upset with me for that review. The comments were lost when we switched the site over to WordPress in 2009, but I remember there literally being hundreds of angry complaints. When I posted the picture of myself with the collector’s cup in the subsequent post, someone went out of their way to tell me I was fat – which I thought was mean. I can probably count on one hand the number of times I’ve gotten cross-ways with readers like that. I’ve been fortunate to have a fairly controversy free “career” in webcomics. I attribute that to the fact that I have very awesome fans. But, boy… that Spider-Man 3 review. A lot of people took that personally. I sleep fine, though. I think 5 years later, history has proven I was pretty much right about that one. So what’s next? Let me tell you what’s next. Last Friday I took the day off from work, sat down and plotted out the last handful of comics I need to produce to bring Theater Hopper to a close. Because here’s the thing: I told you in January that I was ending the comic on August 5. That didn’t pan out. But I’m not about to drag this out into 2013. So, as I’ve decided, there are six comics left for me to produce in order for me to put a bow on this by the end of the year. I managed to pencil half of them on Friday and I’m hoping that will give me the head-start I need to keep me from blowing deadlines between now and then. If all things go to plan, the last Theater Hopper comic will be Monday, December 31 – New Year’s Eve. Of course, this means that I’ll have to step up production between now and then. So that means two comics a week for the next three weeks. I think I can do it, but it’ll be a squeaker considering my birthday is on the 21st and Christmas is right after that. I’ll do what I can. You guys have been more than patient. It’s time to wrap things up and move on. Look for another comic sometime this week! See you soon!